Yossi Milo Gallery is pleased to announce Turn In, an exhibition of large-scale color photographs by Martina Mullaney. The show will open on Friday, March 11, and close on Saturday, April 30, with a reception for the artist on Friday, March 11, from 6:00 to 8:00 p.m. This exhibition will not only be the artist’s first solo show in the United States, but will also inaugurate Yossi Milo Gallery’s new ground-floor space at 525 West 25th Street. In the series Turn In, Mullaney takes loneliness as her subject. Rejecting a traditional documentary approach, the artist does formal studies of temporary sleeping quarters, photographing beds in hostels and shelters for single homeless people in England and Wales. 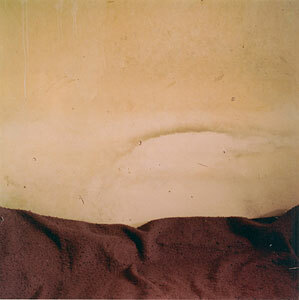 The photographs, which reference color field painting, consist of a blank expanse of wall counterbalanced by a mattress that fills the lower third of the frame. Traces of human occupation are underscored via the inclusion of stray personal belongings and graffiti in the otherwise empty images. The title of the series, Turn In, refers both to going to bed and to closing in on oneself in self-reflection. Mullaney’s stark images reference both meanings as well. Martina Mullaney was born in Ireland in 1972. She currently lives and works in London, where she received a Masters Degree from the Royal College of Art in 2004. Her work has been exhibited abroad, including the Gallery of Photography in Dublin, Ireland, in 2004, and Ffotogallery in Wales in 2002. In 2002, Ffotogallery in Wales published an exhibition catalog of her work. Turn In will run concurrently at Yossi Milo Gallery in New York and Fraenkel Gallery in San Francisco.